1 A None No Power Seat 1 A is a standard Business Class Bulkhead seat. There is a bassinet location here, so passengers traveling with infants are often seated in this row. 1 B None No Power Seat 1 B is a standard Business Class Bulkhead seat. There is a bassinet location here, so passengers traveling with infants are often seated in this row. 1 J None No Power Seat 1 J is a standard Business Class Bulkhead seat. There is a bassinet location here, so passengers traveling with infants are often seated in this row. 1 K None No Power Seat 1 K is a standard Business Class Bulkhead seat. There is a bassinet location here, so passengers traveling with infants are often seated in this row. 11 A None No Power Seat 11 A is a standard Business Class Bulkhead seat in the upper deck of the aircraft. The upper deck has advantages such as quieter cabin, usually more personalized attention, and storage boxes near the window seats. The downside is that you have to walk the stairs. There is a bassinet location here, so passengers traveling with infants are often seated in this row. 11 B None No Power Seat 11 B is a Business Class Bulkhead seat in the upper deck of the aircraft whose close proximity to the lavatory may be bothersome as it is the only one on this deck. The upper deck has advantages such as quieter cabin, usually more personalized attention, and storage boxes near the window seats. The downside is that you have to walk the stairs. There is a bassinet location here, so passengers traveling with infants are often seated in this row. 11 J None No Power Seat 11 J is a Business Class Bulkhead seat in the upper deck of the aircraft whose close proximity to the lavatory may be bothersome as it is the only one on this deck. The upper deck has advantages such as quieter cabin, usually more personalized attention, and storage boxes near the window seats. The downside is that you have to walk the stairs. There is a bassinet location here, so passengers traveling with infants are often seated in this row. 11 K None No Power Seat 11 K is a standard Business Class Bulkhead seat in the upper deck of the aircraft. The upper deck has advantages such as quieter cabin, usually more personalized attention, and storage boxes near the window seats. The downside is that you have to walk the stairs. There is a bassinet location here, so passengers traveling with infants are often seated in this row. 12 A None No Power Seat 12 A is a standard Business Class seat in the upper deck of the aircraft. The upper deck has advantages such as quieter cabin, usually more personalized attention, and storage boxes near the window seats. The downside is that you have to walk the stairs. 12 B None No Power Seat 12 B is a standard Business Class seat in the upper deck of the aircraft. The upper deck has advantages such as quieter cabin, usually more personalized attention, and storage boxes near the window seats. The downside is that you have to walk the stairs. 12 J None No Power Seat 12 J is a standard Business Class seat in the upper deck of the aircraft. The upper deck has advantages such as quieter cabin, usually more personalized attention, and storage boxes near the window seats. The downside is that you have to walk the stairs. 12 K None No Power Seat 12 K is a standard Business Class seat in the upper deck of the aircraft. The upper deck has advantages such as quieter cabin, usually more personalized attention, and storage boxes near the window seats. The downside is that you have to walk the stairs. 14 A None No Power Seat 14 A is a standard Business Class Exit Row seat in the upper deck of the aircraft. The upper deck has advantages such as quieter cabin, usually more personalized attention, and storage boxes near the window seats. The downside is that you have to walk the stairs. There is a bassinet location here, so passengers traveling with infants are often seated in this row. 14 B None No Power Seat 14 B is a standard Business Class Exit Row seat in the upper deck of the aircraft. The upper deck has advantages such as quieter cabin, usually more personalized attention, and storage boxes near the window seats. The downside is that you have to walk the stairs. There is a bassinet location here, so passengers traveling with infants are often seated in this row. 14 J None No Power Seat 14 J is a standard Business Class Exit Row seat in the upper deck of the aircraft. The upper deck has advantages such as quieter cabin, usually more personalized attention, and storage boxes near the window seats. The downside is that you have to walk the stairs. There is a bassinet location here, so passengers traveling with infants are often seated in this row. 14 K None No Power Seat 14 K is a standard Business Class Exit Row seat in the upper deck of the aircraft. The upper deck has advantages such as quieter cabin, usually more personalized attention, and storage boxes near the window seats. The downside is that you have to walk the stairs. There is a bassinet location here, so passengers traveling with infants are often seated in this row. 15 A None No Power Seat 15 A is a standard Business Class seat in the upper deck of the aircraft. The upper deck has advantages such as quieter cabin, usually more personalized attention, and storage boxes near the window seats. The downside is that you have to walk the stairs. 15 B None No Power Seat 15 B is a standard Business Class seat in the upper deck of the aircraft. The upper deck has advantages such as quieter cabin, usually more personalized attention, and storage boxes near the window seats. The downside is that you have to walk the stairs. 15 J None No Power Seat 15 J is a standard Business Class seat in the upper deck of the aircraft. The upper deck has advantages such as quieter cabin, usually more personalized attention, and storage boxes near the window seats. The downside is that you have to walk the stairs. 15 K None No Power Seat 15 K is a standard Business Class seat in the upper deck of the aircraft. The upper deck has advantages such as quieter cabin, usually more personalized attention, and storage boxes near the window seats. The downside is that you have to walk the stairs. 16 J None No Power Seat 16 J is a Business Class seat in the upper deck of the aircraft whose close proximity to the stairs and galleys may be bothersome. The upper deck has advantages such as quieter cabin, usually more personalized attention, and storage boxes near the window seats. The downside is that you have to walk the stairs. 16 K None No Power Seat 16 K is a Business Class seat in the upper deck of the aircraft whose close proximity to the stairs and galleys may be bothersome. The upper deck has advantages such as quieter cabin, usually more personalized attention, and storage boxes near the window seats. The downside is that you have to walk the stairs. 3 E None No Power Seat 3 E is a standard Business Class Bulkhead seat. 3 F None No Power Seat 3 F is a standard Business Class Bulkhead seat. 34 A None No Power Seat 34 A is a Premium Economy Class Bulkhead seat with extra legroom. However, the close proximity to the galleys and stairs may be bothersome. The tray table is in the armrest, making the armrest immovable and slightly reducing seat width. There is no floor storage for this seat during take-off or landing. There is a bassinet location here, so passengers traveling with infants are often seated in this row. 34 B None No Power Seat 34 B is a Premium Economy Class Bulkhead seat with extra legroom. However, the close proximity to the galleys and stairs may be bothersome. The tray table is in the armrest, making the armrest immovable and slightly reducing seat width. There is no floor storage for this seat during take-off or landing. There is a bassinet location here, so passengers traveling with infants are often seated in this row. 35 A None No Power Seat 35 A is a standard Premium Economy Class seat. 35 B None No Power Seat 35 B is a standard Premium Economy Class seat. 36 A None No Power Seat 36 A is a standard Premium Economy Class seat. 36 B None No Power Seat 36 B is a standard Premium Economy Class seat. 36 D None No Power Seat 36 D is a Premium Economy Class Bulkhead seat with restricted legroom. The close proximity to the galleys may be bothersome. The tray table is in the armrest, making the armrest immovable and slightly reducing seat width. There is no floor storage for this seat during take-off or landing. 36 E None No Power Seat 36 E is a Premium Economy Class Bulkhead seat with restricted legroom. The close proximity to the galleys may be bothersome. The tray table is in the armrest, making the armrest immovable and slightly reducing seat width. There is no floor storage for this seat during take-off or landing. 36 F None No Power Seat 36 F is a Premium Economy Class Bulkhead seat with restricted legroom. The close proximity to the galleys may be bothersome. The tray table is in the armrest, making the armrest immovable and slightly reducing seat width. There is no floor storage for this seat during take-off or landing. 36 G None No Power Seat 36 G is a Premium Economy Class Bulkhead seat with restricted legroom. The close proximity to the galleys may be bothersome. The tray table is in the armrest, making the armrest immovable and slightly reducing seat width. There is no floor storage for this seat during take-off or landing. 36 J None No Power Seat 36 J is a Premium Economy Class Bulkhead seat. The close proximity to the galleys may be bothersome. The tray table is in the armrest, making the armrest immovable and slightly reducing seat width. There is no floor storage for this seat during take-off or landing. 36 K None No Power Seat 36 K is a Premium Economy Class Bulkhead seat. The close proximity to the galleys may be bothersome. The tray table is in the armrest, making the armrest immovable and slightly reducing seat width. There is no floor storage for this seat during take-off or landing. 37 A None No Power Seat 37 A is a standard Premium Economy Class seat. 37 B None No Power Seat 37 B is a standard Premium Economy Class seat. 37 D None No Power Seat 37 D is a standard Premium Economy Class seat. 37 E None No Power Seat 37 E is a standard Premium Economy Class seat. 37 F None No Power Seat 37 F is a standard Premium Economy Class seat. 37 G None No Power Seat 37 G is a standard Premium Economy Class seat. 37 J None No Power Seat 37 J is a standard Premium Economy Class seat. 37 K None No Power Seat 37 K is a standard Premium Economy Class seat. 38 A None No Power Seat 38 A is a standard Premium Economy Class seat that is missing a window. 38 B None No Power Seat 38 B is a standard Premium Economy Class seat. 38 D None No Power Seat 38 D is a standard Premium Economy Class seat. 38 E None No Power Seat 38 E is a standard Premium Economy Class seat. 38 F None No Power Seat 38 F is a standard Premium Economy Class seat. 38 G None No Power Seat 38 G is a standard Premium Economy Class seat. 38 J None No Power Seat 38 J is a standard Premium Economy Class seat. 38 K None No Power Seat 38 K is a standard Premium Economy Class seat. 39 A None No Power Seat 39 A is a Premium Economy Class seat that may not recline due to the Bulkhead behind. 39 B None No Power Seat 39 B is a Premium Economy Class seat that may not recline due to the Bulkhead behind. 39 D None No Power Seat 39 D is a Premium Economy Class seat that may not recline due to the Bulkhead behind. 39 E None No Power Seat 39 E is a Premium Economy Class seat that may not recline due to the Bulkhead behind. 39 F None No Power Seat 39 F is a Premium Economy Class seat that may not recline due to the Bulkhead behind. 39 G None No Power Seat 39 G is a Premium Economy Class seat that may not recline due to the Bulkhead behind. 39 J None No Power Seat 39 J is a Premium Economy Class seat that may not recline due to the Bulkhead behind. 39 K None No Power Seat 39 K is a Premium Economy Class seat that may not recline due to the Bulkhead behind. 43 A None No Power Seat 43 A is a standard Economy Class seat with extra legroom. The tray table is in the armrest, making the armrest immovable and slightly reducing seat width. There is no floor storage for this seat during take-off or landing. There is a bassinet location here, so passengers traveling with infants are often seated in this row. 43 B None No Power Seat 43 B is a standard Economy Class seat with extra legroom. The tray table is in the armrest, making the armrest immovable and slightly reducing seat width. There is no floor storage for this seat during take-off or landing. There is a bassinet location here, so passengers traveling with infants are often seated in this row. 43 C None No Power Seat 43 C is a standard Economy Class seat with extra legroom. The tray table is in the armrest, making the armrest immovable and slightly reducing seat width. There is no floor storage for this seat during take-off or landing. There is a bassinet location here, so passengers traveling with infants are often seated in this row. 43 D None No Power Seat 43 D is a standard Economy Class seat with extra legroom. The tray table is in the armrest, making the armrest immovable and slightly reducing seat width. There is no floor storage for this seat during take-off or landing. There is a bassinet location here, so passengers traveling with infants are often seated in this row. 43 E None No Power Seat 43 E is a standard Economy Class seat with extra legroom. The tray table is in the armrest, making the armrest immovable and slightly reducing seat width. There is no floor storage for this seat during take-off or landing. There is a bassinet location here, so passengers traveling with infants are often seated in this row. 43 F None No Power Seat 43 F is a standard Economy Class seat with extra legroom. The tray table is in the armrest, making the armrest immovable and slightly reducing seat width. There is no floor storage for this seat during take-off or landing. There is a bassinet location here, so passengers traveling with infants are often seated in this row. 43 G None No Power Seat 43 G is a standard Economy Class seat with extra legroom. The tray table is in the armrest, making the armrest immovable and slightly reducing seat width. There is no floor storage for this seat during take-off or landing. There is a bassinet location here, so passengers traveling with infants are often seated in this row. 43 H None No Power Seat 43 H is a standard Economy Class seat with extra legroom. The tray table is in the armrest, making the armrest immovable and slightly reducing seat width. There is no floor storage for this seat during take-off or landing. There is a bassinet location here, so passengers traveling with infants are often seated in this row. 43 J None No Power Seat 43 J is a standard Economy Class seat with extra legroom. The tray table is in the armrest, making the armrest immovable and slightly reducing seat width. There is no floor storage for this seat during take-off or landing. There is a bassinet location here, so passengers traveling with infants are often seated in this row. 43 K None No Power Seat 43 K is a standard Economy Class seat with extra legroom. The tray table is in the armrest, making the armrest immovable and slightly reducing seat width. There is no floor storage for this seat during take-off or landing. There is a bassinet location here, so passengers traveling with infants are often seated in this row. 44 A None No Power Seat 44 A is an Economy Class seat, however, the proximity to the lavatories may be bothersome. 44 B None No Power Seat 44 B is an Economy Class seat, however, the proximity to the lavatories may be bothersome. 44 C None No Power Seat 44 C is an Economy Class seat, however, the proximity to the lavatories may be bothersome. 44 D None No Power Seat 44 D is an Economy Class seat, however, the proximity to the lavatories may be bothersome. 44 E None No Power Seat 44 E is an Economy Class seat, however, the proximity to the lavatories may be bothersome. 44 F None No Power Seat 44 F is an Economy Class seat, however, the proximity to the lavatories may be bothersome. 44 G None No Power Seat 44 G is an Economy Class seat, however, the proximity to the lavatories may be bothersome. 44 H None No Power Seat 44 H is an Economy Class seat, however, the proximity to the lavatories may be bothersome. 44 J None No Power Seat 44 J is an Economy Class seat, however, the proximity to the lavatories may be bothersome. 44 K None No Power Seat 44 K is an Economy Class seat, however, the proximity to the lavatories may be bothersome. 46 A None No Power Seat 46 A is an Economy Class Exit Row seat with extra legroom. However, the close proximity to the lavatories may be bothersome. The tray table is in the armrest, making the armrest immovable and slightly reducing seat width. There is no floor storage for this seat during take-off or landing. 46 B None No Power Seat 46 B is an Economy Class Exit Row seat with extra legroom. However, the close proximity to the lavatories may be bothersome. The tray table is in the armrest, making the armrest immovable and slightly reducing seat width. There is no floor storage for this seat during take-off or landing. 46 C None No Power Seat 46 C is an Economy Class Exit Row seat with extra legroom. However, the close proximity to the lavatories may be bothersome. The tray table is in the armrest, making the armrest immovable and slightly reducing seat width. There is no floor storage for this seat during take-off or landing. 46 D None No Power Seat 46 D is an Economy Class Exit Row seat with extra legroom. However, the close proximity to the lavatories may be bothersome. The tray table is in the armrest, making the armrest immovable and slightly reducing seat width. There is no floor storage for this seat during take-off or landing. 46 E None No Power Seat 46 E is an Economy Class Exit Row seat with extra legroom. However, the close proximity to the lavatories may be bothersome. The tray table is in the armrest, making the armrest immovable and slightly reducing seat width. There is no floor storage for this seat during take-off or landing. 46 F None No Power Seat 46 F is an Economy Class Exit Row seat with extra legroom. However, the close proximity to the lavatories may be bothersome. The tray table is in the armrest, making the armrest immovable and slightly reducing seat width. There is no floor storage for this seat during take-off or landing. 46 G None No Power Seat 46 G is an Economy Class Exit Row seat with extra legroom. However, the close proximity to the lavatories may be bothersome. The tray table is in the armrest, making the armrest immovable and slightly reducing seat width. There is no floor storage for this seat during take-off or landing. 46 H None No Power Seat 46 H is an Economy Class Exit Row seat with extra legroom. However, the close proximity to the lavatories may be bothersome. The tray table is in the armrest, making the armrest immovable and slightly reducing seat width. There is no floor storage for this seat during take-off or landing. 46 J None No Power Seat 46 J is an Economy Class Exit Row seat with extra legroom. However, the close proximity to the lavatories may be bothersome. The tray table is in the armrest, making the armrest immovable and slightly reducing seat width. There is no floor storage for this seat during take-off or landing. 46 K None No Power Seat 46 K is an Economy Class Exit Row seat with extra legroom. However, the close proximity to the lavatories may be bothersome. The tray table is in the armrest, making the armrest immovable and slightly reducing seat width. There is no floor storage for this seat during take-off or landing. 5 B None No Power Seat 5 B is a standard Business Class Exit Row seat. This seats is perfect for people traveling on their own. There is nobody next to you and plenty of extra storage. 5 D None No Power Seat 5 D is a standard Business Class Exit Row seat. 5 E None No Power Seat 5 E is a standard Business Class Exit Row seat. 5 F None No Power Seat 5 F is a standard Business Class Exit Row seat. 5 J None No Power Seat 5 J is a standard Business Class Exit Row seat. This seats is perfect for people traveling on their own. There is nobody next to you and plenty of extra storage. 55 D None No Power Seat 55 D is an Economy Class seat that may not recline. The close proximity to the galleys may be bothersome. 55 E None No Power Seat 55 E is an Economy Class seat that may not recline. The close proximity to the galleys may be bothersome. 55 F None No Power Seat 55 F is an Economy Class seat that may not recline. The close proximity to the galleys may be bothersome. 55 G None No Power Seat 55 G is an Economy Class seat that may not recline. The close proximity to the galleys may be bothersome. 56 A None No Power Seat 56 A is an Economy Class seat that may not recline. The close proximity to the galleys may be bothersome. 56 B None No Power Seat 56 B is an Economy Class seat that may not recline. The close proximity to the galleys may be bothersome. 56 C None No Power Seat 56 C is an Economy Class seat that may not recline. The close proximity to the galleys may be bothersome. 56 H None No Power Seat 56 H is an Economy Class seat that may not recline. The close proximity to the galleys may be bothersome. 56 J None No Power Seat 56 J is an Economy Class seat that may not recline. The close proximity to the galleys may be bothersome. 56 K None No Power Seat 56 K is an Economy Class seat that may not recline. The close proximity to the galleys may be bothersome. 58 A None No Power Seat 58 A is an Economy Class Exit Row seat with extra legroom. However, the close proximity to the galleys may be bothersome. The tray table is in the armrest, making the armrest immovable and slightly reducing seat width. There is no floor storage for this seat during take-off or landing. 58 B None No Power Seat 58 B is an Economy Class Exit Row seat with extra legroom. However, the close proximity to the galleys may be bothersome. The tray table is in the armrest, making the armrest immovable and slightly reducing seat width. There is no floor storage for this seat during take-off or landing. 58 C None No Power Seat 58 C is an Economy Class Exit Row seat with extra legroom. However, the close proximity to the galleys may be bothersome. The tray table is in the armrest, making the armrest immovable and slightly reducing seat width. There is no floor storage for this seat during take-off or landing. 6 B None No Power Seat 6 B is a standard Business Class seat. 6 E None No Power Seat 6 E is a standard Business Class seat. 6 J None No Power Seat 6 J is a standard Business Class seat. 6 K None No Power Seat 6 K is a standard Business Class seat. 60 A None No Power Seat 60 A is a standard Economy Class seat. There is a bassinet location here, so passengers traveling with infants are often seated in this row. 60 B None No Power Seat 60 B is a standard Economy Class seat. There is a bassinet location here, so passengers traveling with infants are often seated in this row. 60 C None No Power Seat 60 C is a standard Economy Class seat. There is a bassinet location here, so passengers traveling with infants are often seated in this row. 60 D None No Power Seat 60 D is an Economy Class Bulkhead seat whose close proximity to the galleys may be bothersome. The tray table is in the armrest, making the armrest immovable and slightly reducing seat width. There is no floor storage for this seat during take-off or landing. There is a bassinet location here, so passengers traveling with infants are often seated in this row. 60 E None No Power Seat 60 E is an Economy Class Bulkhead seat whose close proximity to the galleys may be bothersome. The tray table is in the armrest, making the armrest immovable and slightly reducing seat width. There is no floor storage for this seat during take-off or landing. There is a bassinet location here, so passengers traveling with infants are often seated in this row. 60 F None No Power Seat 60 F is an Economy Class Bulkhead seat whose close proximity to the galleys may be bothersome. The tray table is in the armrest, making the armrest immovable and slightly reducing seat width. There is no floor storage for this seat during take-off or landing. There is a bassinet location here, so passengers traveling with infants are often seated in this row. 60 G None No Power Seat 60 G is an Economy Class Bulkhead seat whose close proximity to the galleys may be bothersome. The tray table is in the armrest, making the armrest immovable and slightly reducing seat width. There is no floor storage for this seat during take-off or landing. There is a bassinet location here, so passengers traveling with infants are often seated in this row. 60 H None No Power Seat 60 H is an Economy Class Bulkhead seat that may have extra legroom. The close proximity to the galleys may be bothersome. The tray table is in the armrest, making the armrest immovable and slightly reducing seat width. There is no floor storage for this seat during take-off or landing. There is a bassinet location here, so passengers traveling with infants are often seated in this row. 60 J None No Power Seat 60 J is an Economy Class Bulkhead seat that may have extra legroom. The close proximity to the galleys may be bothersome. The tray table is in the armrest, making the armrest immovable and slightly reducing seat width. There is no floor storage for this seat during take-off or landing. There is a bassinet location here, so passengers traveling with infants are often seated in this row. 60 K None No Power Seat 60 K is an Economy Class Bulkhead seat that may have extra legroom. The close proximity to the galleys may be bothersome. The tray table is in the armrest, making the armrest immovable and slightly reducing seat width. There is no floor storage for this seat during take-off or landing. There is a bassinet location here, so passengers traveling with infants are often seated in this row. 69 A None No Power Seat 69 A is an Economy Class seat that may feel cramped due to the configuration change from 3 to 2 seats. Couples often prefer sitting in this row as it is one of the only twosomes in Economy. 69 B None No Power Seat 69 B is an Economy Class seat that may feel cramped due to the configuration change from 3 to 2 seats. Couples often prefer sitting in this row as it is one of the only twosomes in Economy. 69 J None No Power Seat 69 J is an Economy Class seat that may feel cramped due to the configuration change from 3 to 2 seats. Couples often prefer sitting in this row as it is one of the only twosomes in Economy. 69 K None No Power Seat 69 K is an Economy Class seat that may feel cramped due to the configuration change from 3 to 2 seats. Couples often prefer sitting in this row as it is one of the only twosomes in Economy. 7 B None No Power Seat 7 B is a standard Business Class seat. 7 E None No Power Seat 7 E is a standard Business Class seat. 7 K None No Power Seat 7 K is a standard Business Class seat. 70 A None No Power Seat 70 A is a standard Economy Class seat. Couples often prefer sitting in this row as it is one of the only twosomes in Economy. 70 B None No Power Seat 70 B is a standard Economy Class seat. Couples often prefer sitting in this row as it is one of the only twosomes in Economy. 70 J None No Power Seat 70 J is a standard Economy Class seat. Couples often prefer sitting in this row as it is one of the only twosomes in Economy. 70 K None No Power Seat 70 K is a standard Economy Class seat. Couples often prefer sitting in this row as it is one of the only twosomes in Economy. 71 A None No Power Seat 71 A is a standard Economy Class seat. Couples often prefer sitting in this row as it is one of the only twosomes in Economy. 71 B None No Power Seat 71 B is a standard Economy Class seat. Couples often prefer sitting in this row as it is one of the only twosomes in Economy. 71 D None No Power Seat 71 D is a standard Economy Class seat. 71 G None No Power Seat 71 G is a standard Economy Class seat. 71 J None No Power Seat 71 J is a standard Economy Class seat. Couples often prefer sitting in this row as it is one of the only twosomes in Economy. 71 K None No Power Seat 71 K is a standard Economy Class seat. Couples often prefer sitting in this row as it is one of the only twosomes in Economy. 72 A None No Power Seat 72 A is a standard Economy Class seat. Couples often prefer sitting in this row as it is one of the only twosomes in Economy. 72 B None No Power Seat 72 B is a standard Economy Class seat. Couples often prefer sitting in this row as it is one of the only twosomes in Economy. 72 D None No Power Seat 72 D is a standard Economy Class seat. 72 E None No Power Seat 72 E is a standard Economy Class seat. 72 F None No Power Seat 72 F is a standard Economy Class seat. 72 G None No Power Seat 72 G is a standard Economy Class seat. 72 J None No Power Seat 72 J is a standard Economy Class seat. Couples often prefer sitting in this row as it is one of the only twosomes in Economy. 72 K None No Power Seat 72 K is a standard Economy Class seat. Couples often prefer sitting in this row as it is one of the only twosomes in Economy. 73 A None No Power Seat 73 A is an Economy Class seat in the last row of the plane that may not recline. The close proximity to the lavatories may be bothersome. Couples often prefer sitting in this row as it is one of the only twosomes in Economy. 73 B None No Power Seat 73 B is an Economy Class seat in the last row of the plane that may not recline. The close proximity to the lavatories may be bothersome. Couples often prefer sitting in this row as it is one of the only twosomes in Economy. 73 D None No Power Seat 73 D is a standard Economy Class seat. 73 E None No Power Seat 73 E is a standard Economy Class seat. 73 F None No Power Seat 73 F is a standard Economy Class seat. 73 G None No Power Seat 73 G is a standard Economy Class seat. 73 J None No Power Seat 73 J is an Economy Class seat in the last row of the plane that may not recline. The close proximity to the lavatories may be bothersome. Couples often prefer sitting in this row as it is one of the only twosomes in Economy. 73 K None No Power Seat 73 K is an Economy Class seat in the last row of the plane that may not recline. The close proximity to the lavatories may be bothersome. Couples often prefer sitting in this row as it is one of the only twosomes in Economy. 74 D None No Power Seat 74 D is an Economy Class seat whose close proximity to the lavatories may be bothersome. 74 E None No Power Seat 74 E is an Economy Class seat whose close proximity to the lavatories may be bothersome. 74 F None No Power Seat 74 F is an Economy Class seat whose close proximity to the lavatories may be bothersome. 74 G None No Power Seat 74 G is an Economy Class seat whose close proximity to the lavatories may be bothersome. 75 D None No Power Seat 75 D is an Economy Class seat in the last row of the plane that may not recline. The close proximity to the lavatories may be bothersome. 75 E None No Power Seat 75 E is an Economy Class seat in the last row of the plane that may not recline. The close proximity to the lavatories may be bothersome. 75 F None No Power Seat 75 F is an Economy Class seat in the last row of the plane that may not recline. The close proximity to the lavatories may be bothersome. 75 G None No Power Seat 75 G is an Economy Class seat in the last row of the plane that may not recline. The close proximity to the lavatories may be bothersome. 8 A None No Power Seat 8 A is a Business Class seat whose close proximity to the lavatories, galleys, and stairs may be bothersome. 8 B None No Power Seat 8 B is a Business Class seat whose close proximity to the lavatories, galleys, and stairs may be bothersome. 8 D None No Power Seat 8 D is a Business Class seat whose close proximity to the lavatories, galleys, and stairs may be bothersome. 8 E None No Power Seat 8 E is a Business Class seat whose close proximity to the lavatories, galleys, and stairs may be bothersome. 8 F None No Power Seat 8 F is a Business Class seat whose close proximity to the lavatories, galleys, and stairs may be bothersome. 8 J None No Power Seat 8 J is a Business Class seat whose close proximity to the lavatories, galleys, and stairs may be bothersome. 8 K None No Power Seat 8 K is a Business Class seat whose close proximity to the lavatories, galleys, and stairs may be bothersome. The Boeing 747-400RR offers 1000 CDs, a selection of audio books and 20 radio channels. Qantas Airways' international flight entertainment system includes 100 movies, over 500 television programs and 80 games. You also have access to Qantas Airways' Lonely Planet interactive destination guides and Kids Zone. Power outlets are available in Business and Premium Economy on selected international B747-400s. This aircraft provides 110V AC (60 Hz) power and accepts most household power plugs including: Australian 2 or 3 pin, European 2 pin, Japanese 2 or 3 pin and USA 2 or 3 pin. Customers using UK 2 or 3 pin plugs must use an adapter. Qantas Airways flies this version of the Boeing 747-400RR Longreach with 364 seats in a three-class configuration of Business, Premium Economy, and Economy. 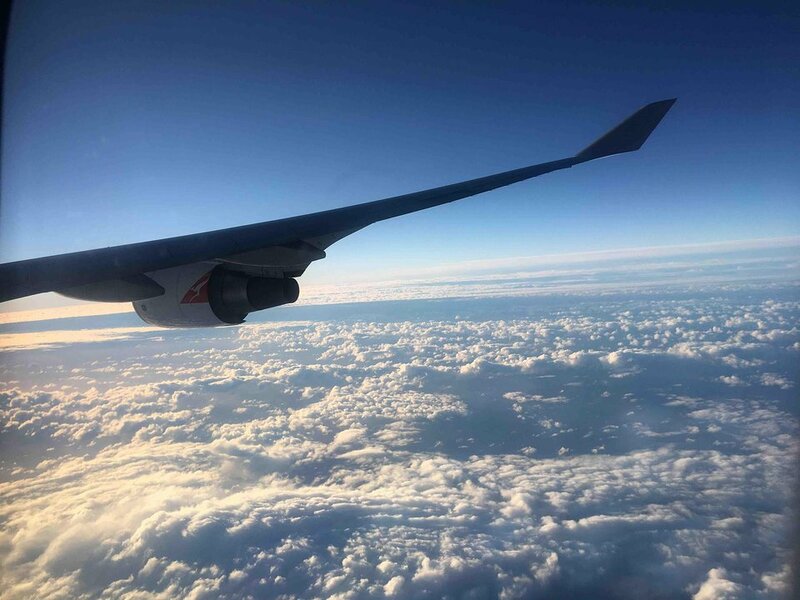 We flew this on 2 Sept 2018. Seats location is good, no noise or busyness from the toilets in the Biz class in front. Standard premium econ seats. Seat comfort was OK. IFE didn't work at all in this flight. Service & meals good. I'd choose these seats again. Note - row 34 seems to have less legroom, row 39AB looks good as no-one behind you & they do seem to have the same reclining room. 5E is the worse seat ever. No storage space for handbag. Have to climb over sleeping neighbours to access aisle. The seat has quite a bit of space. Surprised that this seat is not marked as 'green'. This version of plane is currently used for SYD-JNB. 5B is also okay - but you may be closer to the entry door for boarding/disembarking. Not sure which plane it was, but the power socket was very worn and wouldn't keep my two prong power plug in. It didn't work for QF63 and QF64 (flew two weeks apart for return). Bit of a bummer to have my devices run out of juice. The seat was ok. full lie-flat. The crew add a mattress to it. The only trouble is that 747's are now pretty old, & the business class is looking a little tired. The seat wobbles when people walk by, & 747 noise is higher than say A380s. Crew were quite good. As this & QF26 are late-ish flights, the food & drink quantities aren't too abundant. We also had the middle seat coming back, which is OK. The barriers between seats could go higher though! 70K and 70A are both good choices in economy. They're a row behind where the fuselage starts to taper and as a result there's a decent amount of extra legroom to the right (70K) or to the left(70A). This is particularly good on some of the longer flights this aircraft operates on. Scored this premium business seat thanks to a friendly QF business associate. As others have stated, for single travellers the best seats (5B and 5J) in business class. No-one next to you, a storage locker, and all the advantages of a business pod seat. The only slight detraction is limited views outside due to the distance from the window, but an adequate view of the scenery is still possible. Good seat - room for storage next to you, lots of space to go to bathroom, etc. If you have bigger carry on bags, you obviously have to put it up top. 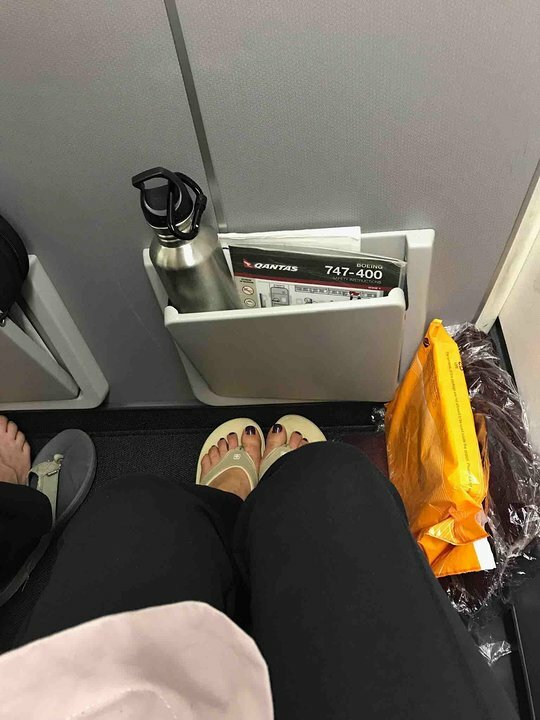 I used SeatGuru to choose this seat for my flight from Brisbane to LA, and it was exactly as advertised. If you are a solo traveler, this is the seat for you. I really appreciated the privacy, extra storage space, and the fact that I didn't have to climb over anyone or be climbed over for aisle access. Yes, the plane is showing its age, but the crew did their best to ensure comfort. The bedding was above average compared to what I have experienced on other airlines, and the food and service were excellent. LAX-BNE very old and tired plane , visible dust on air vents, when seats reclined the tray tables fell down, arm rest on 53A broken resulting in crackling intermittent audio. 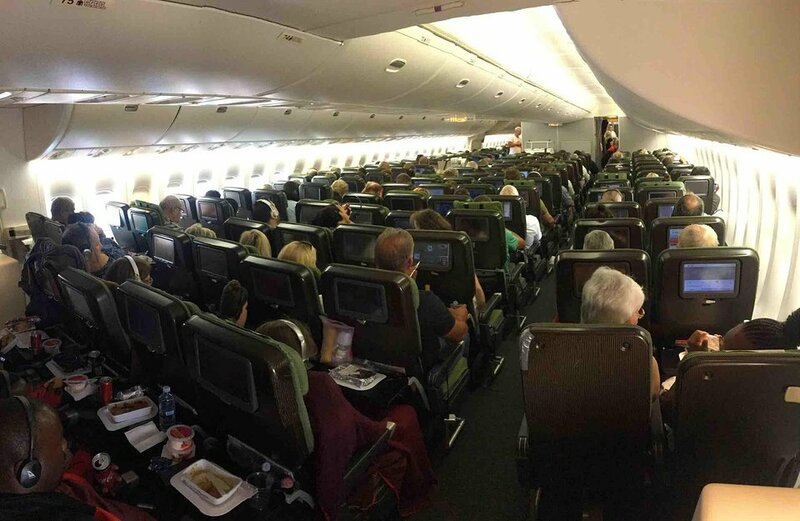 Seats stuck in recline position Cramped hot flight with little service. I understand qantas are retiring the 747's soon but they should stll maintain thrm properly in the interim. I chose 16K as the legroom is superb, there are no seats on the other side s0 it feels very private, toilets are at the front so disturbance is minimal. Window count is superb  there are 4 well placed windows just for this seat. Recommended. Paid a small premium for window and middle seat in row 60. Bulkhead. The seating chart indicates additional leg room however there was LESS leg room than a normal economy seat. Felt very claustrophobic. Enough room to stand with back against the bulkhead wall (i am 5'5"). Would not choose again, let alone pay extra for! Comfortable seat in the forat cabin of thw lower deck, cabin is small, and due to location you only have a maximum of 8 people walking past due to its location. Unlike the second cabin that see much more foot traffic due to bathroom & galley. Seat locates on the Upper Deck, which made you feel like you were travelling in a business only aircraft. Seat very comfortable, and 4 windows to enjoy the view. 14A directly in front on benefits from 1 window. Quieter cabin upstairs with additional space to store about 2 to 3 small cabin bags. No need to use overhead bins. Much easier to get to than having to get up. No one is behind you, just a jump seat so you can take a little more of the side storage than say 10K could. Sometimes a queue to use the bathroom as only one on the upper deck but a quick stroll downstairs has you at 2 rear bathrooms. Seat is great. Massage option is good on 12+ hour trips across the pacific. For row 44 ABC and HJK there is full recline on the seats. All premium economy seats in row 39 fully recline. Usb charging was very slow, and laptop power was only available later in the flight. 39j and k can be a little noisy as it is directly in front of economy. These seats are perfect for people travelling on their own. There is nobody next to you and plenty of extra storage. The flight attendants called this seat (and 5B, which is identical) the 'rock star' seat. There is no 5K (or 5A) and in place is a storage bin big enough for a full backpack, and which doubles as a handy work desk when closed. There is no seat in front which suited me as someone who is 6'5. Probably the best seat in business. Seat looks directly into business class galley where different meals were prepared the entire flight. Not a good seat due to constant noise and smells. There is one toilet in front of 34a/b (acessed by a convenint passageway in front of 36feg ) which makes those seats terrible however you can slip past the curtain into the business class toilets too. Flew from LAX-MEL on 20th Jan 2016. It's been nearly 10 years since I last travelled on a 747, and it seems to have improved greatly! It looked just like the A380 inside which was great, as the A380 looks amazing! The 747 is slightly louder than the A380, but not much more louder. The food was great, the entertainment was fantastic, the flight attendants were excellent, and as a great perk, 53B was unoccupied, so I got to sleep easily! Window seats much to be preferred for the extra storage. And i'd probably prefer to be a few rows forward of this because it was a bit noisy for meal preparation and clean up times. Mind you, there was a crying toddler in the front row for the 14hr flight so no one had a good time really. Why allow toddlers in business? I was on this plane on the LAX-SYD flight and this seat for the SYD-LAX flight. This seat was good, it was spacious and quiet enough and the wings weren't blocking the window view. It is a fantastic plane. The interior is incredibly spacious, the ceilings are high and the walls are not curved. The plane has more of a rectangular interior, giving increased room and comfort for the feel of being in say, a house. The plane is incredibly smooth, very little turbulence even in rough conditions. 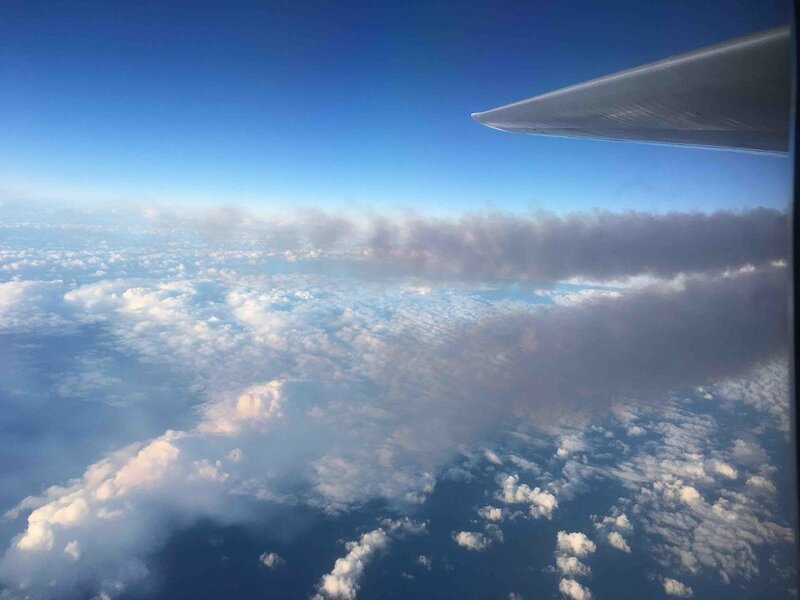 The pressure changes between altitudes are barely noticeable. The engine noise is not bothersome but not eerily quiet either. The seats are comfortable and even in economy they are roomy. The Qantas service itself was decent, the air hostesses were polite and attendant, and the food was fairly tasty. There are so many more excellent things about this plane, I highly recommend riding on the 747 above anything else. We actually rode in 39 A & B on both of our recent QF trans pacific flights. Although the seats are tight to the next separating wall they do recline fully PLUS you get a very useful storage space between the seats and the wall. I'd rate these seats as attractive compared to the regular locations. This is important on 14 to 15 hour flights! This seat is perfect for the solo traveller who likes space and privacy. The exit row location, away from busy service areas makes for easy access and an undisturbed flight. 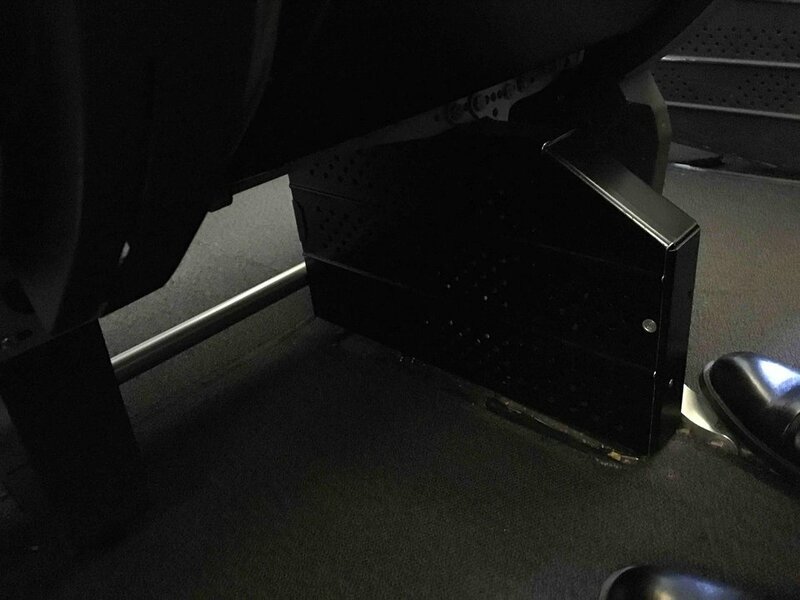 The deep flat-topped storage bin at seat level doubles as a handy large surface for drinks, books etc. Quite the best Qantas 747 business class seat location yet. Fantastic seat - continuous isle access and quiet. 5B also good but much noisier. This was a typical but fairly comfortable seat. The space between the window and the seat was a great place to put my Akubra hat. I loved the location of this seat and would select it again. Qantas flies 2 versions of Boeing 747-400RR.